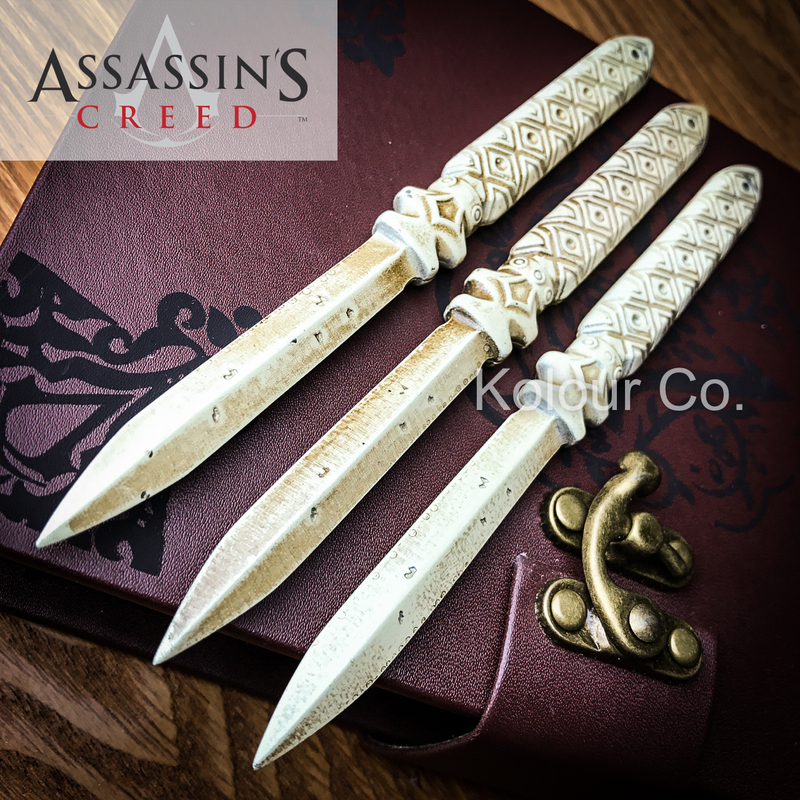 Officially licensed, the three unique, rustic throwing knife replicas in this ensemble mirror those wielded by the the blockbuster film and video game series, "Assassin’s Creed," legendary character, Aguilar. 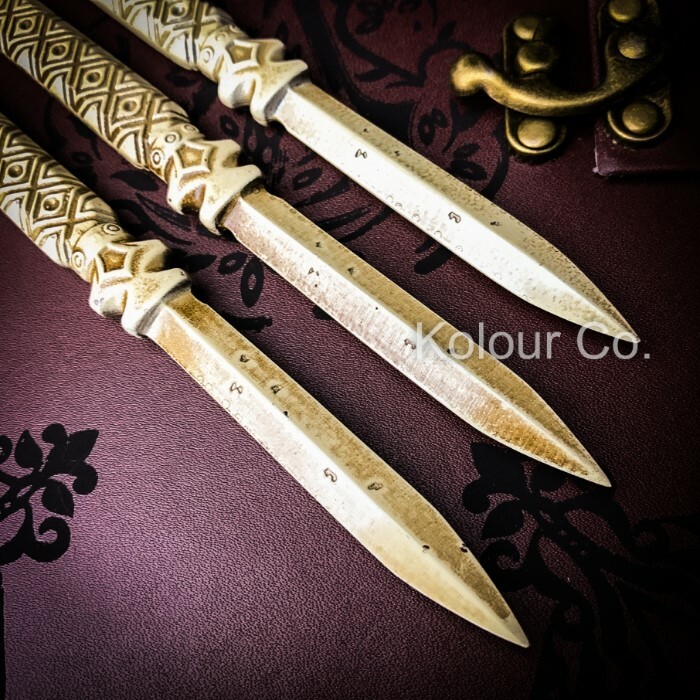 Each 6 1/4" throwing knife replica features a rugged stainless steel core, enhanced with a weathered ivory-colored coating and exquisitely patterned handle. Painstakingly reproduced using the original 3-D game blueprint and movie prop as a guide, no detail is neglected in this exceptional set. 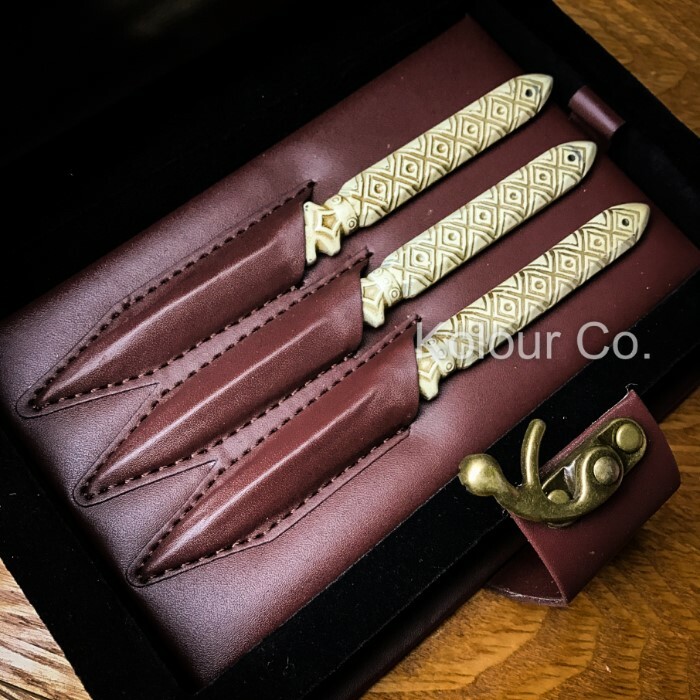 The knives tuck away snugly in a handsome faux leather pouch, which itself stores inside a cool faux leather box that mimics an antique leather-bound journal, complete with brass-colored clasp and ornate Assassin's Creed-themed cover and spine art. A certificate of authenticity is also included in the "journal" box. Perfect for any Assassin's Creed fan, the Aguilar's Throwing Knife Set looks fantastic displayed practically anywhere - mantle, coffee table, desk, bookshelf - the list goes on! Don't forget the gamers and cinema enthusiasts in your life! ABOUT "ASSASSIN'S CREED: Through a revolutionary technology that unlocks his genetic memories, Callum Lynch experiences the adventures of his ancestor, Aguilar, in 15th Century Spain. Callum discovers he is descended from a mysterious secret society, the Assassins, and amasses incredible knowledge and skills to take on the oppressive and powerful Templar organization in the present day.